At some stage the adulation and praise that Qatar received was always going to give way to some grumblings of one flavor or another. To any country, I repeat, please do not give any funds or weapons to any Libyan faction without the approval of the NTC. The second issue is one that has been latent for some months. Moussa Koussa left the UK for Qatar in April. It was becoming far too difficult for him to stay in the UK given his murderous past. Now in Qatar he has, I am sure, proved exceedingly useful to the Qataris and thus indirectly to the NATO alliance in working out who is who in Libya, what Gaddafi is was likely to be up to and where he was most lilely to flee to. Plus a host of other bits and pieces that only long time close confidant of Gaddafi could know. This was the price for his residency in Qatar. Yet now – on the ball as ever – the BBC doorstepped him after after miraculously ‘tracking him down’ to the Four Seasons in Doha (it’s not like it’s been written in numerous articles, or anything x x). It is likely that there will be a sizable push to bring Koussa to some kind of justice, perhaps in Tripoli, perhaps in the Hague. 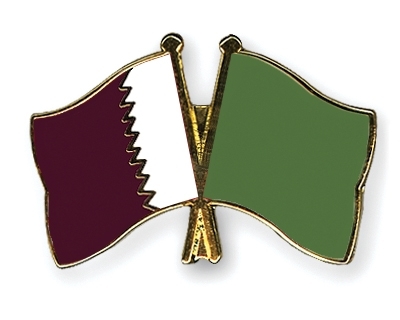 This will put Qatar in a difficult position, as it will be difficult for Qatar to give up Koussa. Not only would such a notion go against deep-seated notions in this part of the world of hosting a guest (whomever that may be) but Qatar will not want to set a precedent of cow-towing to other powers to hand over someone with whom they have had dealings. Indeed, Qatar sees itself as something of a refuge for various international misfits ranging from one of Saddam Hussein’s wifes to one of Osama Bin Laden’s sons. Yet if Qatar does not hand over Koussa as demanded by ‘the Libyan people’ (such a demand is surely not far off) then it risks frittering away the credit that it has built up. Indeed, the TNC’s pointed remarks are already chipping away. Overall, I don’t really think that Qatar is trying to push its Islamist allies (for that is who most of them are) because they are Islamist per se. I see Qatar’s support of Belhaj et al as mostly a factor of simple connections: they already had relations with Al Salibi and Bejhaj and thus they supported them. Certainly, Qatar is a proud, religious and conservative state and would want to support moderate Islamists, as they are doing, but it is hardly the case that they would refuse to support liberals or someone else. The fact is that if the West is expecting liberals and explicitly non-Islamist candidates to win offices after the Arab Spring, then there will be a lot of disappointed people in London and Washington. Certainly, Qatar must take into account the TNC’s growing power and their wholly understandable and justified desire to control the weapons going in and out of their country. Yet I also detect a simple pang of jealousy as a motivating factor for the jibes against Qatar. No, I’m not trying to castigate those complaining about Qatar, just point out that it is logical for those without Qatari support to feel irked that someone else is getting truck loads of cash and arms. And if and when such people complain that they are not getting funded because Qatar are funding their own Islamists or some such notion, then I think they are being a bit cheeky and trying to pressure Qatar to stop using the wholly bust Western-created trope and specter of ‘Islamists gaining power’. This is not to say that Qatar does not have some master plan to push one particular Islamist strand or whatever, just that I don’t know anything about such a plan and it sounds unlike the Qatar that I do know. As for Koussa, Qatar’s best bet would either be to send him economy class to the Hague now, sticking up for justice and all that, or send him off to some tin-pot African country that wouldn’t care a jot about ICC demands. No, this is not an edifying conclusion, but this is high politics that we’re referring to, after all, not never-never land. This is the best insider column on Libya and Qatar that I have read all week. Thank you for the frank realpolitik. You manage to stay on the right side of the line of cynicism. Most reporting on the issues in your article is marred by several defects: first and foremost being an inflexible ideological lens. The next is pure old laziness married to pride; when a reporter or analyst has no time to do independent fact-checking or verification (he or) she often takes another unexamined analysis and incorporates its ethos and assumptions as buried premise. The third thing is pandering or what I can Hockey Reporting. This is the tendency to reduce to a cartoonized ‘league play’ analysis, as if the reporter understood not only the game but all the teams and all the players. So, just it case you thought I was logrolling or flattering, there you go! You win some, you lose some, but both of these are great cartoons. Actually, you did relaly well because A Beginner’s Guide got into the gallery. How many weeks have you been sending your work to The Guardian? Exactly! Well done David.